In French, when a word ending in a normally silent consonant is followed by a vowel or h muet, that consonant might be transferred onto the next word. This euphonic technique is called a liaison and it’s one of the aspects of French pronunciation that can make it difficult to determine where one word ends and the next begins. Certain consonants offer a further complication: they change sound. The normally silent s at the end of vous is not pronounced like an s in a liaison, but rather like a z. Other consonants have similar changes – see chart. As if that’s not enough, some liaisons are required, others are optional, and still others are forbidden. Just because a normally silent consonant is followed by a vowel or mute h does not automatically mean that a liaison must or even can occur. 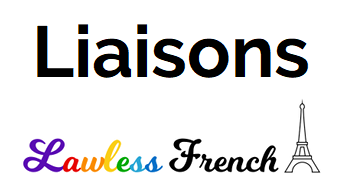 The rules for when and why to pronounce liaisons are fairly complicated and have to do with linguistics and register – I’ll explain this in more detail in a future lesson. Liaisons are not the same thing as enchaînement – see the comparison at the end of that lesson.